This product applies to heat deformation and Vicat softening point temperature testing of non-metal material, such as plastic, rubber, nylon, and Electrical insulating material. It is essential instrument for R&D institution, college, and QA department of enterprises. TY-5006 Thermal deformation Vicat softening point tester uses computer display and PLC for temperature adjustment. This product is easy-handling, stable-Performance and with high precision. Users can supervise the test temperature and deformation during testing. The system could stop heating automatically when test finished, and test report and test curve can be printed through computer. TY-5006 Hdt/Vicat Heat Deformation Point Tester is a necessary equipment for any quality inspection company, school and manufacturing enterprise. Looking for ideal Thermoplastic Heat Deformation Point Tester Manufacturer & supplier ? We have a wide selection at great prices to help you get creative. All the Thermoplastic Vicat Softening Point Test Machine are quality guaranteed. 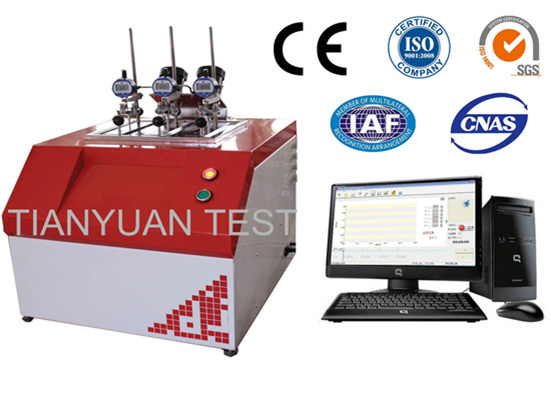 We are China Origin Factory of Thermoplastic Vicat Softening Point Tester. If you have any question, please feel free to contact us.